JACKSON — Mississippi hunters smashed back-to-back records on the opening weekend of the state’s 10-day alligator season by bagging some of the biggest critters on the books. 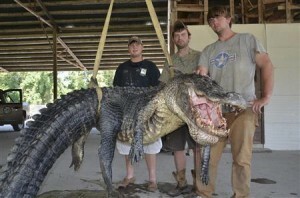 Within hours of the August 30 opener, one hunting party caught the state’s longest and heaviest female gator at 10 feet and 295.3 pounds, according to the Mississippi Department of Wildlife, Fisheries and Parks. A second record was broken shortly after midnight on September 1, when a different group of hunters nabbed the state’s heaviest male alligator at 723.5 pounds. That distinction lasted about an hour, until another party captured one weighing 727 pounds, and measuring 13 feet. Dustin Bockman, a 27-year-old UPS driver, and his crew spotted the mammoth creature in the Mississippi River and trailed it for two hours before getting close enough to spear it. It took another two hours to hook it with a second line and noose its neck. Eventually, Bockman had to shoot the alligator. It took another two hours and two extra men to hoist the gator on the boat, capping a gruelling hunt that had Bockman’s girlfriend understandably nervous. Larger alligators have been trapped in Florida, weighing up to 1,000 pounds, and one last year measured 14-feet. This is Mississippi’s ninth annual alligator season in a sport with growing popularity, said the state’s alligator program coordinator Ricky Flynt.